Taryn Manning is an actor, singer-songwriter and fashion designer who rose to prominence after starring opposite Britney Spears in the road-trip movie Crossroads. Alongside further film appearances and recurring roles in several high profile TV shows - including, most recently, Orange Is the New Black – Manning is also one half of electronic duo Boomkat, has a successful solo career and runs the fashion label Born Uniqorn. Manning currently stars in The Vault, opposite James Franco, as Vee Dillon – one of three siblings planning a bank heist. London Calling sat down to talk about her latest film, and how she juggles so many different interests. London Calling: Good afternoon Taryn! Thank you very much for speaking to us. Please could you start by telling us a little bit about The Vault, and your part in it? 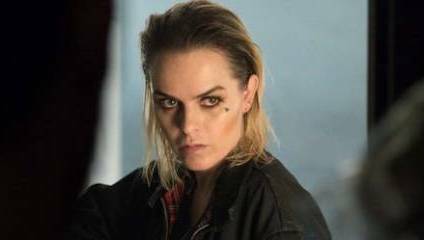 Taryn Manning: The Vault starts out as a movie about a bank heist. The Dillon siblings – I play Vee, Francesca Eastwood plays my sister Leah, and Scott Haze my brother Michael – plan the robbery. Leah is just out of the military, I’ve been in prison for a stretch of time, and Michael is a bit lost – he’s dealing with some family stuff. The movie begins as an action shoot-‘em-up, until we run into a gentleman who gives us some information that’s a little “out there”, and then it turns into a psychological thriller. It’s cool, well executed, and I personally enjoyed myself because I like playing with guns! LC: How was the filming process? Were director Dan Bush and co-star James Franco good fun to work with? TM: It was cool! We were in Atlanta, and it was super hot, though most of the shoot was inside. I enjoyed hanging out with the cast, and it was great to watch James Franco, and his process: he’s very smart and such a good actor! He’s refreshing to be around – it’s always exciting to be around great actors. Dan really cares about the story – it’s what he always came back to during the shoot. I really like directors who write their own scripts – I feel they’re the most attached – and the best directors know what they really want. LC: How did you find coming back to film after all your TV work? TM: It was actually really nice – I enjoy making movies. I love TV as well, but it’s more difficult because you don’t always know the beginning and end of the story. With films you get the whole script and you can put a lot in, develop your character and do your research. I feel totally at ease switching between the two. The biggest things you learn are the technicalities, the lingo, and how to be an efficient actor who helps move the process along. LC: How do you manage balancing successful acting, music and business careers – were you always aiming to work in different fields or did you fall into it? TM: It’s a lot to juggle, and at times it’s pretty challenging because of that, but I was speaking to someone recently about how everything comes down to timing. I might take a hiatus from movies, but that doesn’t mean that the perfect film or project won’t suddenly appear - and then our availabilities have to match. There are moments where timing just doesn’t work out, and that’s when I’m thankful to have started out other businesses and have other streams of revenue. An actor’s life is tough. It’s very unpredictable: there’s always someone there who’s better, or wants it more. Having other avenues makes me a more confident actor. It also keeps things interesting and fresh. When I play music I get to travel to places and meet great people, because when people watch music they’re there to have fun. It’s important for people to let loose because there’s so much stress elsewhere. Music is something that makes me very happy. LC: Given your talent as a musician, are there any dream biopic roles you’d like to play? TM: I’ve always had an interest in Blondie, and I’ve read a lot about her. She’s funky, one of the first white females to rap, and I love the ground she paved. I also like that, at the height of her career, the man she loved fell ill and she just stood by his bedside – right when she was top of the charts. Hers was a true, undying love and she’s still going now – still doing her thing – which I think is beautiful. LC: What’s on your cultural radar right now? TM: There’s a festival coming up in New York call The Meadows, with Gorillaz and Red Hot Chili Peppers, which I’m excited about and I recently went to another festival and saw Justice and Nine Inch Nails – two completely different bands but I love them both. I love festivals because there are so many bands, and there’s something great around every corner.